Lacquer Lockdown: Oh You Sweet Tart! I've got a sweet treat lined up today for you today! So sugary you might get cavities so schedule your dental exams in advance. 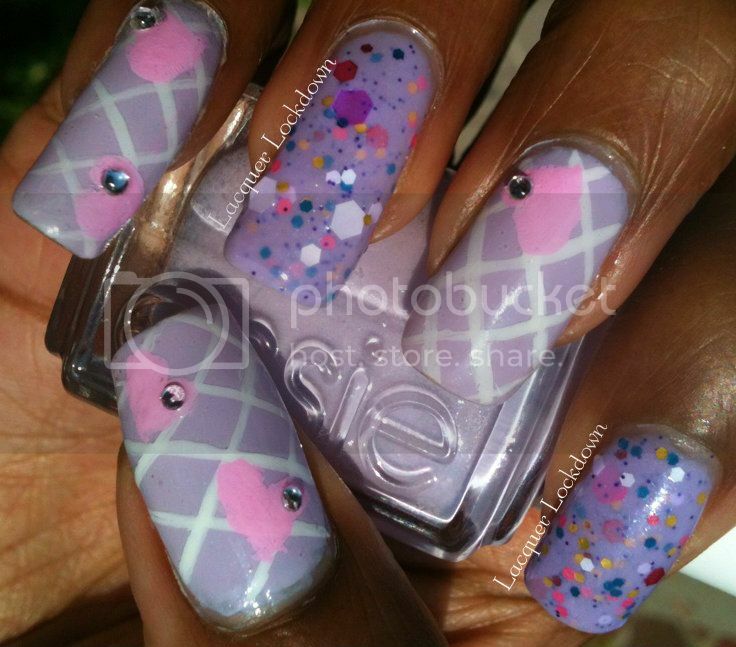 I decided to do something cutesy and went for hearts, lavender and all things tart. Sometimes a girl just wanted to feel well girly and this is my manicure equivalent to a tub of Ben & Jerry's (wink wink). I painted my thumb, index, and ring fingers with Essie's To Buy or Not to Buy as a base color. I love TBONTB. It's an adorable creme lavender without any true blue undertones with a subtle amount of blue and purple microshimmer. Yum! I did a simple freehand crosshatch on top and then painted hearts in pink acrylic paint and finally applied clear rhinestones. I was able to capture the true color of my nails on this shot. Cute right? My accent nails are painted with Pretty & Polished Tart. Tart is DENSE! 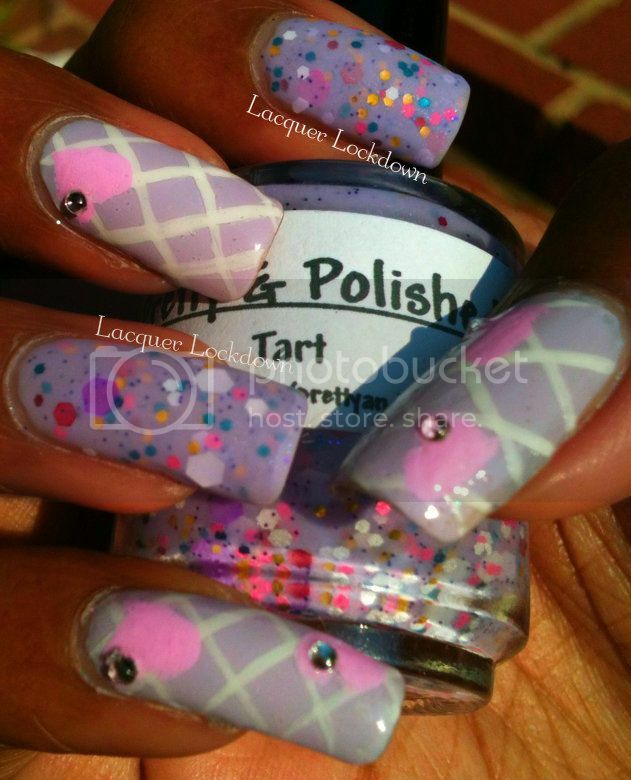 It's a lavender polish chalk full of large and small hexes of pink, blue, red, white, and gold. It also has a deep purple microshimmer as well. I used three coats here for opacity. The formula on this was a dream to apply despite the density. So dreamy in fact that I need to get a back up to make sure I have more of this to satisfy my constant sweet tooth. I also decided to try a matte top coat on just for fun! Look at the intensity of the sparkle in Tart after the matte topcoat! It's even prettier matte than shiny. Check out the hot pink hexagons! So what do you ladies think? I hope you like it because I had so much fun putting this little look together! I can't wait to try more of my P&P polishes. If you're interested in Tart or finding any other lovely polishes by the very talented Chelsea check her out her on Etsy or check out her blog. She has some amazing polishes and excellent customer service. I've ordered from her twice now and it has always been pleasant with lightening speed shipping. Song Currently Stuck In My Head: My Man (Single) by Billie Holiday. "It cost me lot but there's one thing I got it's my man." Goodness I love this song! Old and sultry. A bad man, a good woman, and driven love. This type of song is great for smokey Saturday mornings, jumbo, and hard lemonade in the heat. Anyhoo thanks for reading and see you next post! This is so lovely! 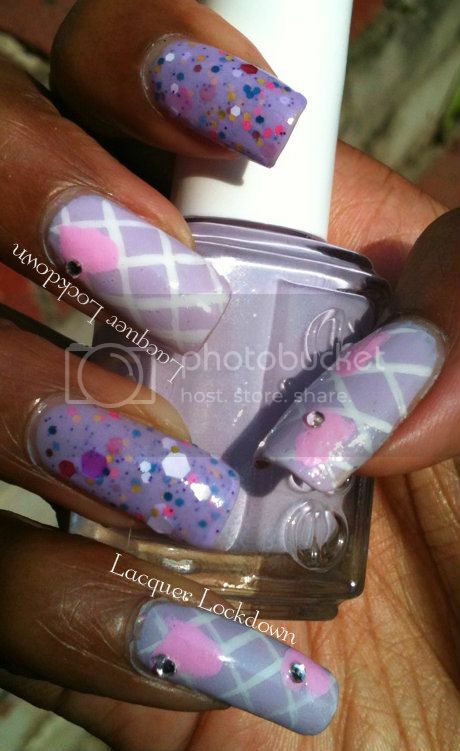 Tart is to die for, I am such a huge fan of glitter and lavender base! Thank you hun :) I'm a sucker for lavender anything! This is the first glitter I've owned that's lavender. Do you know any other good ones (shifty eyes)? Oh thank you kindly doll!